The feminist thinkers in this collection are the designated "fifty-one key feminist thinkers," historical and contemporary, and also the authors of the entries. Collected here are fifty-one key thinkers and fifty-one authors, recognizing that women are fifty-one percent of the population. There are actually one hundred and two thinkers collected in these pages, as each author is a feminist thinker, too: scholars, writers, poets, and activists, well-established and emerging, old and young and in-between. These feminists speak the languages of art, politics, literature, education, classics, gender studies, film, queer theory, global affairs, political theory, science fiction, African American studies, sociology, American studies, geography, history, philosophy, poetry, and psychoanalysis. Speaking in all these diverse tongues, conversations made possible by feminist thinking are introduced and engaged. Each entry is supported by a list of the thinker’s major works, along with further reading suggestions. An ideal resource for students and academics alike, this text will appeal to all those interested in the fields of gender studies, women’s studies and women’s history and politics. In Fifty-One Key Feminist Thinkers Lori Marso has brought together an excellent collection of accessible yet incisive, rich and original semi-biographical essays on key feminist thinkers, ranging from Sappho and Sojourner Truth to Nawal El Saadawi and Judith Butler. The volume is an invaluable resource for anyone interested in feminist thinking in all its variety and complexity. 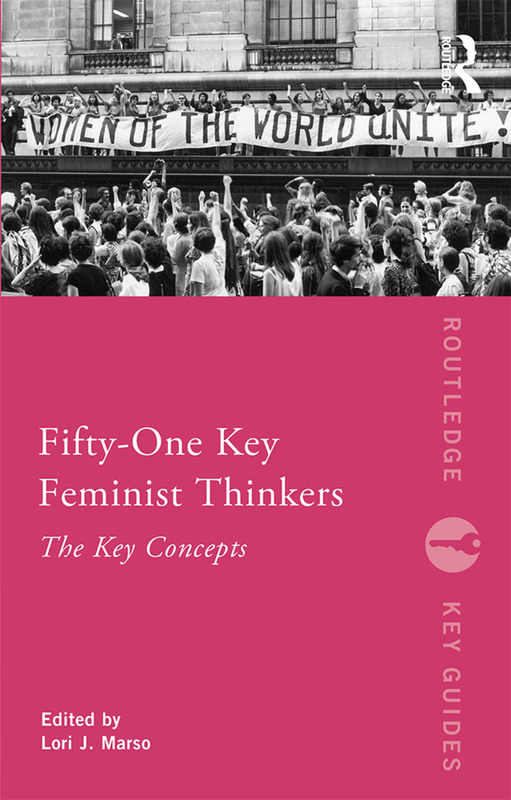 Showing readers that feminist theory remains one of the most exciting sites for engaging questions of both political thought and action, Fifty-One Key Feminist Thinkers creates a remarkable conversation between feminist theorists past and present. Considering questions of identity, freedom, power, justice, desire, autonomy, inclusion, difference, and what "counts" as feminism— Fifty-One Key Feminist Thinkers offers reader a thought-provoking vision of the past and future of feminist theory. Lori Marso has done an artful job of selecting authors to tell the stories of feminism. This is a delightful collection of the intellectual contributions of a range of feminist thinkers. Fifty-One Key Feminist Thinkers, edited by Lori J. Marso, is a timely and notably well-pitched intervention into feminism’s recent and distant pasts. The book is a collection of short biographical and critical chapters in a neat reference work that will be indispensable to students and researchers new to feminist thinking, or to those wishing to refresh their knowledge. The fifty-one short articles here are remarkable achievements in their brevity combined with significant coverage of key biographical details, works, debates and controversies attached to each thinker. These are accompanied by a list of the thinkers in historical order, and an excellent index. The volume is therefore suited ideally to the fast pace of research and teaching today, and will appeal to even the most Google-enamoured undergraduate in its navigable and readable style and organization. One of the pleasures of this book is its range of styles, which never detract from the chapters’ authoritative summaries of complex ideas. Lori Marso is Professor of Political Science and former director of Gender, Sexuality, and Women's Studies at Union College in Schenectady, New York USA. She has published widely in feminist and political theory. Recent books include Feminist Thinkers and the Demands of Femininity (Routledge, 2006); a forthcoming co-edited volume, Gender, Power, and Politics in the Films of Lars von Trier (Oxford, 2016); and a new book on Simone de Beauvoir to be published by Duke University Press, Politics with Beauvoir: Freedom in the Encounter.